Jonathan and Tessa began playing together at the Pegasus Arms pub sessions on Monday evenings, and may still be found there most weeks at the second table on the right. They have since appeared without warning in various places, ranging from Boo Radleys to the Waimate Festival, the Folk Club’s Evening of Irish Music and Dance, and the Fingerpicking Delights II concert. Jonathan has for a long time has played lute with early music groups around the country, including Affetto, NZ Barok, Baroque Voices and Il Raccolto. On being told for the 50th time that people liked the lute because it was so restful, he looked for something louder and launched into acoustic guitar, which he now tries to play as quietly as possible. Tessa started violin two months ago at age 5, and at some point her violin turned out to be a fiddle. She has also been known to pick up tenor banjo, mandolin, guitar, and lute. When not herding artists at festivals she gets asked to join in on stage where she says she mimes impeccably. Their repertoire includes a lot of Celtic tunes, arrangements of anything from Leo Kottke to computer game music, and a few originals they are grateful not to have to categorize. 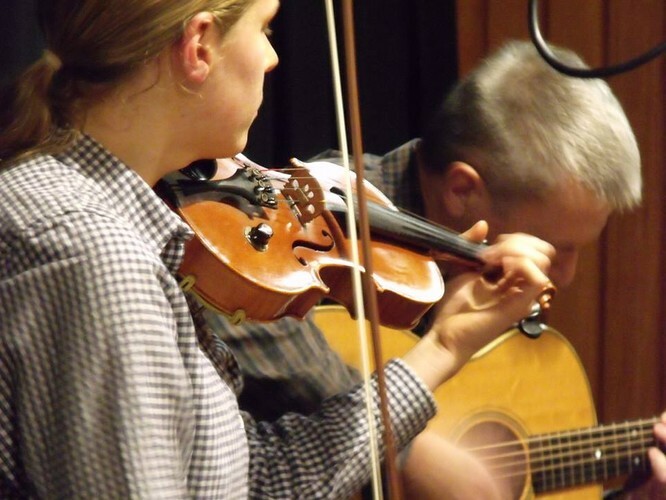 Their musical style was recently described as "Celtic Expresso with Tessa's fluid fiddle over Jonathan's supercharged whirr of strummed inversions and passing chords. Amongst all this frenetic action we can look forward to some slower melodious lines on the mandolin cradled by lush fingerpicked nests of guitar chords." They describe their musical philosophy in the words of the great American thinker, John Wayne: "Never apologise, never explain." Door sales cash only. Please note there is no Eftpos available on site. Tea, coffee, biscuits and cake available during the break, also cash bar facilities for cold refreshments throughout the night.